Puzzle difficulty is indicated by the number of wine jugs below the clue, ranging from one (easy) to five (quite challenging). As of October 2017, puzzles are posted each weekday, starting with a one-jugger on Monday and increasing in difficulty each day until a five-jugger on Friday. All of the puzzles in the current month are open, and you may submit solutions to any and all of them here. (If you are submitting solutions on Instagram, please include a username and email address you’d like to use with your first submission.) Each correct solution earns you that puzzle’s number of wine jugs on the leaderboard. You may send only one solution per puzzle, so please be sure before you hit the submit button. If you send a solution that is not the intended one but potentially acceptable, your case will be duly submitted to and generously considered by a balanced jury of two, because I’m a Gemini. At midnight on the last day of the month, the puzzles will be closed and the answers revealed. Prizes shall be awarded each month. The first item available is a handsome Anagrams Around Eve notepad, well-suited to doodling, writing little sweet nothings to your partner, or, you know, rearranging scribbled letters in hopes of solving a ridiculous puzzle. The solver (or solvers, in the event of a tie — more on that below) finishing with the most wine jugs will automatically receive a notepad, and then be removed from the pool, after which five more notepads will be awarded at random in the style of the NHL weighted draft lottery: your probability of being selected increases in proportion with your jug total. And, what’s more, nobody shall win more than one notepad! So even if you don’t think you can finish on top, by all means still send in as many solutions as you can before the deadline, and you’ll improve your odds. 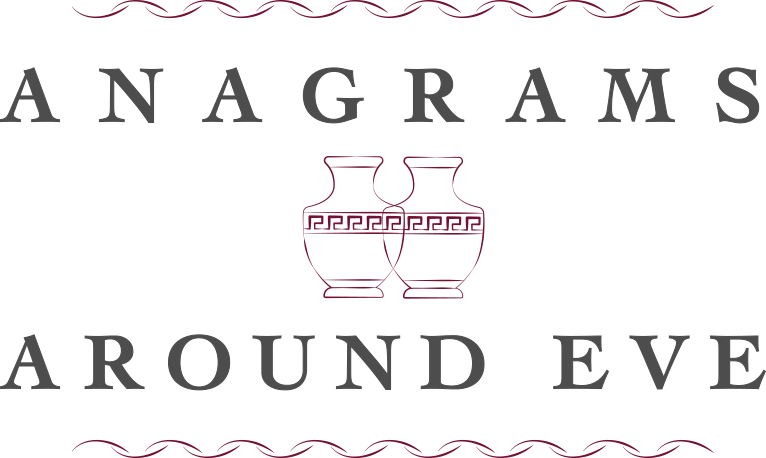 In addition, the solver with the most wine jugs (or the solver who wins the tiebreaker) will also receive a special set of novelty anagram puzzles that will not appear in the regular daily puzzle series, but will become available for separate purchase. The first novelty set I’m putting together — called “Triunes” — uses anagrams of three words/lines rather than the usual two. So for the next couple of months, the winner will receive a pack of Triunes gratis. In the future, as I make more novelty packs, the winner will be able to choose from those available. In the event of a tie, I will arrange with all first-place parties a date and time to send out a special puzzle, and the first to respond with a correct solution will be the winner. I’ll only do this if all parties agree to and are excited by the format. Otherwise, we can figure out something else or simply have a coin toss. To be emailed your current standing, make a request here. To be notified by email when a new puzzle is posted, please sign up at the form at bottom. If you prefer to be notified via social media, follow on Instagram, Facebook, or Twitter (icons at bottom). Instagram is a popular way to follow these puzzles, as you can DM your solutions right there in the app. Thank you for playing. I hope you enjoy solving these puzzles as much as I do making them!